Delosperma is the extensive sort from the family of Aizoaceae. These incredibly beautiful semi-bushes and grassy plants numbering 100-150 types which in the wild nature live mainly in Africa. Delosperma (in translation from Greek – "a visible seed") often is called "an ice plant" as on her leaves it is possible to see the small crystals of calcium similar to ice. In Africa it is considered that this plant brings good luck. Branched or creeping stalks of Delosperma reach in height of 10-30 cm. Leaves can be smooth; usually have a green color. There are grades with the interesting pointed papilla on leaves. 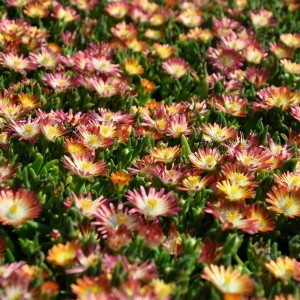 Delosperma's flowers, partly similar to daisies, happen various coloring, often to brilliant petals. That for the night or in cloudy weather they are closed is remarkable. Plentiful blossoming of Delosperma lasts since the end of spring to late fall, as explains its popularity among the selectors working on removal of new frost-resistant grades. Seeds are very small (less than 1 mm), have black color. Delosperma. Delosperma variety. Delosperma cultivation.